Country: USA Wingspan: 29' 6"
Year: 1926 Length: 23' 0"
Horsepower: 90 Gross Weight: 1800 lbs. 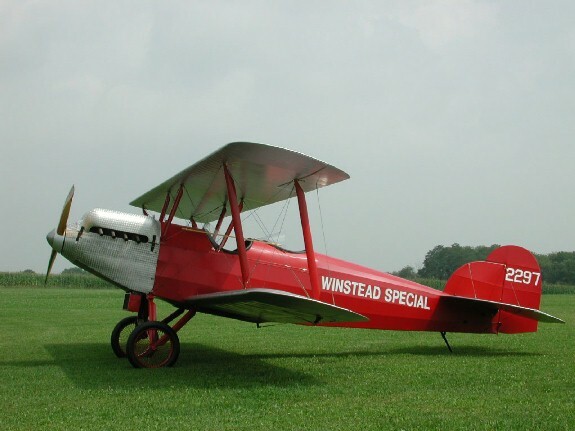 The Winstead Special was manufactured by Brothers Carl and Guy Winstead in Wichita, Kansas. The airplane was initially used for flying circus work, air racing and barnstorming. Carl Winstead flew it with the "Flying Aces Air Circus" in the late 1920s where circus owner and legendary female wing walker Jessie Woods walked its wings. The aircraft was bought and sold several times throughout the 1930s and made its final flight in 1937 before being placed into long term storage. The airplane was acquired in the mid-1990s and painstakingly restored it to its former glory. The restoration was completed over a four-year period and is restored to its flying circus configuration.